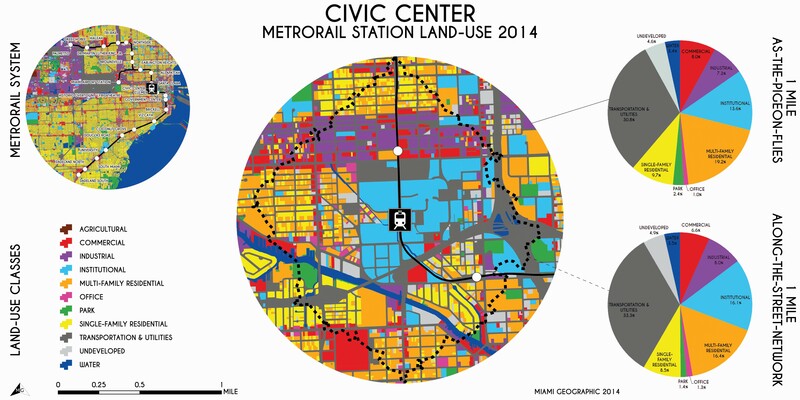 System-Wide Metrorail Station Land-Use, 2014. Data Source: MDC Land-Use Management Application (LUMA). Map Source: Matthew Toro. 2014. Miami’s rapid transit Metrorail train system currently consists of 23 stations running along a nearly 25-mile elevated, heavy-rail, dual-track corridor. Opened in May 1984, Metrorail is operated and maintained by Miami-Dade Transit (MDT), an agency of the Miami-Dade County administration. Miami’s Metrorail System and Traversed Municipalities. Source: Matthew Toro. 2014. With Metrorail turning 30 years old this very month, Miami Geographic will be celebrating the anniversary with an in-depth look at how the system works. Toward that end, I’ll be starting here today with what is arguably the single-most important feature of any major public transportation system: land-use. Land-use is simply the economic purpose for which land resources are utilized, or, stated even more simply, the way humans use land. Land-use represents the geographic anatomy of a region. It determines the spatial structure and performance of human settlement systems. To understand the way Miami’s Metrorail train system works — in terms of its capacity to move people throughout the metro region and connect them to the various destinations required for them to make a living and sustain their lives — it’s critical to understand the land-use configurations surrounding and served by the train corridor. We’re talking about places where people live, work, and play. A bit more specifically, we’re talking about origins and destinations like homes; places of employment; schools, colleges, and universities; grocery stores, pharmacies, restaurants, and other retail locations; churches, mosques, and temples; parks, open-, and green-spaces; sites of extraction, manufacturing, production, and waste management and disposal; and government buildings such as city and county halls, courthouses, and other facilities administering public services; etc. So let’s imagine that the Metrorail transit corridor is actually a large artery for distributing the life blood of the city (people) to Miami’s organs (the city’s various land-use amenities), each of which contributes to the system’s urban metabolism. Which land-use organs are most supported by flow of people through the Metrorail artery? How well connected are the different organs of the urban system? 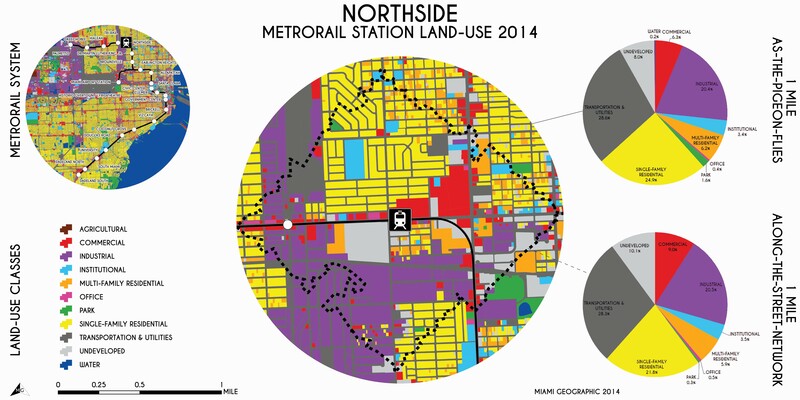 Before we jump right into it, let’s quickly go over how Metrorail land-use was assessed. 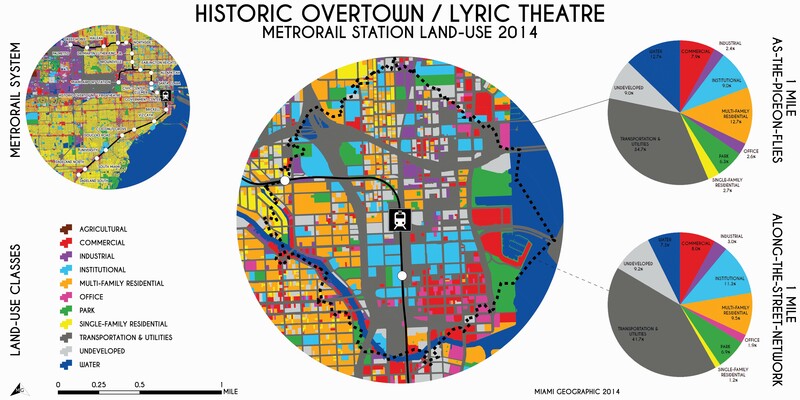 Metrorail System 1-Mile Euclidean (“As-the-Pigeon-Flies”) 2014 Land-Use Corridor. Source: Matthew Toro. 2014. 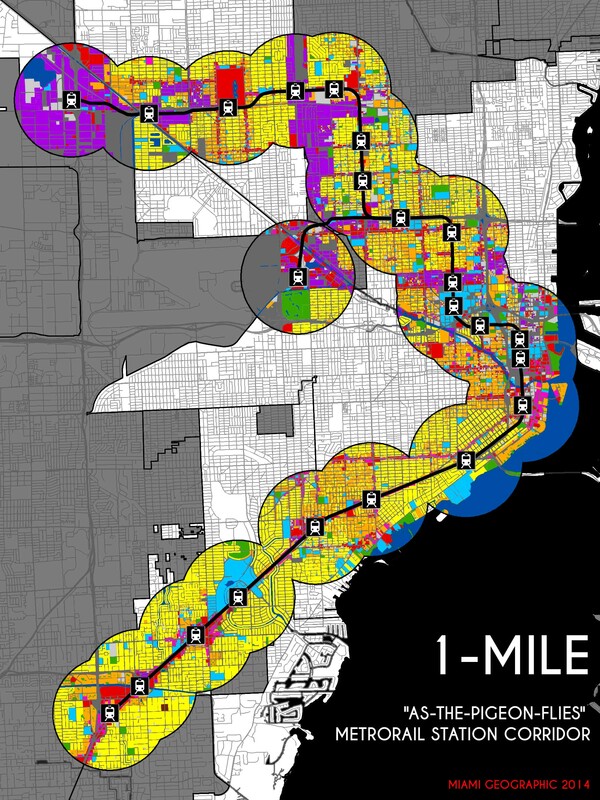 Metrorail System 1-Mile Network (“Along-the-Street-Network”) 2014 Land-Use Corridor. Source: Matthew Toro. 2014. The graphic below illustrates the very different geometric outcomes produced when each of these two area-delineation methods is employed. Metrorail’s Government Center Station, in the heart of downtown Miami, was used in this example. 1-Mile Euclidean (“As-the-Pigeon-Flies”) & 1-Mile Network (“Along-the-Street-Network”) Area-Delineation Methods. Source: Matthew Toro. 2014. Land-use data for 2014 came from the Miami-Dade County Land-Use Management Application (LUMA), accessible from the Miami-Dade County GIS Self Services platform. Within each of the two 1-mile area-delineation types — as-the-pigeon-flies and along-the-street-network — the proportion of each of these 11 land-use classes was calculated. In the station-by-station descriptions below, I make reference only to the along-the-street-network land-use proportions, although those for the as-the-pigeon-flies areas are reported in the maps too. Let’s start at Metrorail’s southern terminus. Dadeland South is the second busiest station after Government Center. The Datran office complex, along with the other offices in the downtown Dadeland area, is represented within the 4.9% of office use. Dadeland Mall, as well as the various other retail and restaurant sites within downtown Dadeland, account for the 13.3% in commercial use. Single-family residential dominates at 31.9%, while multi-family apartments and condominiums occupy 15.6%. 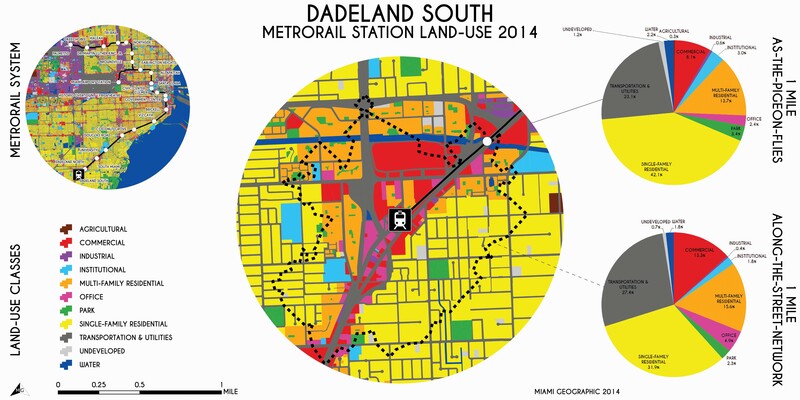 Dadeland South Metrorail Station Land-Use, 2014. Data Source: MDC Land-Use Management Application (LUMA). Map Source: Matthew Toro. 2014. Dadeland North station shares in much of the same land-use amenities as its moniker-sharing counterpart to the south. However, the share of single-family residences is nearly 10% greater. Multi-family residences correspondingly decrease, and despite the presence of the Dadeland Station shopping center, commercial use remains slightly less in Dadeland North than in Dadeland South. Interesting to note is the small, less than 1% agricultural land-use here, as well as the slightly larger proportion of undeveloped parcels. 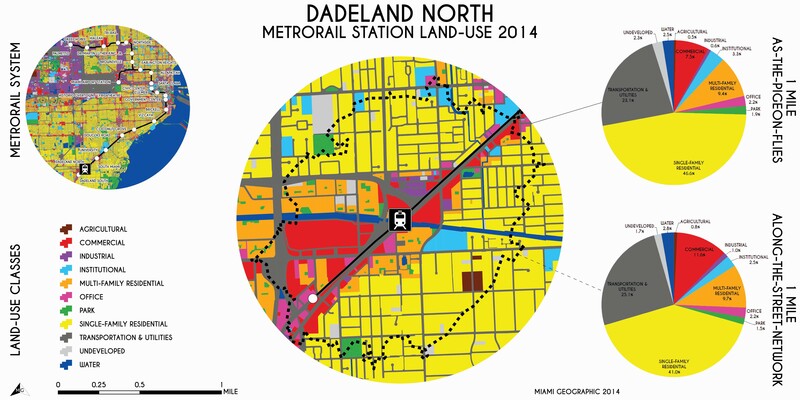 Dadeland North Metrorail Station Land-Use, 2014. Data Source: MDC Land-Use Management Application (LUMA). Map Source: Matthew Toro. 2014. 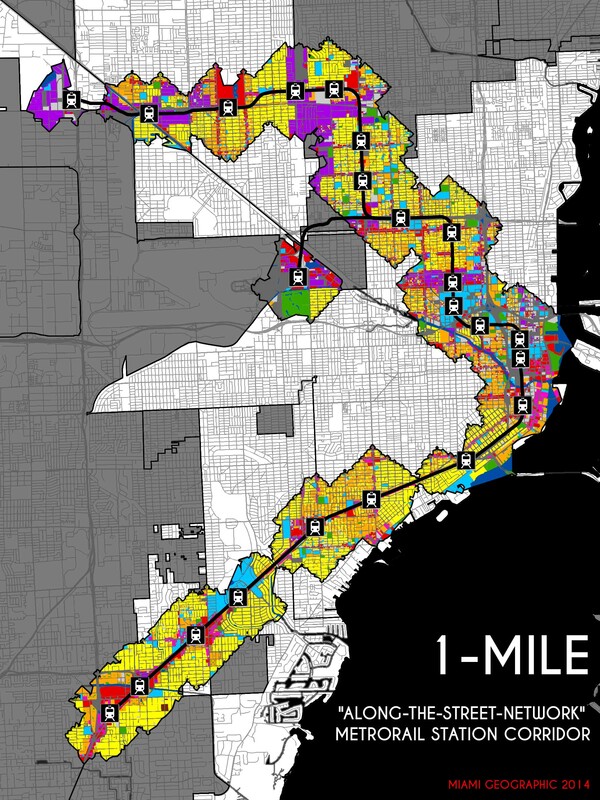 South Miami station is surrounded predominantly by residential use: 37.7% for single- and 7.9% for multi-family. The City of South Miami’s downtown business core is found just across US-1 from the South Miami Metrorail station. Boutique clothing shops, pleasant restaurants offering a range of tastes and price-points, and some popular bars are found adjacent to the Sunset Place open-air shopping center. Even with all that, commercial use comes in at just 6.6%. Offices amount to 4.6%. Assessed at both absolute (as-the-pigeon-flies) or relative (along-the-street-network) 1-mile distances, South Miami station includes the western edge of the City of Coral Gables, including a sizable chunk of the University of Miami’s primary campus. That, along with some public, charter, and private schools in area, account for the more than 10% of institutional use. South Miami Metrorail Station Land-Use, 2014. Data Source: MDC Land-Use Management Application (LUMA). Map Source: Matthew Toro. 2014. University station is dominated by two land-use types: residential (especially that of the single-family variety: 33.2%) and institutional (primarily for the University, schools, and religious buildings). 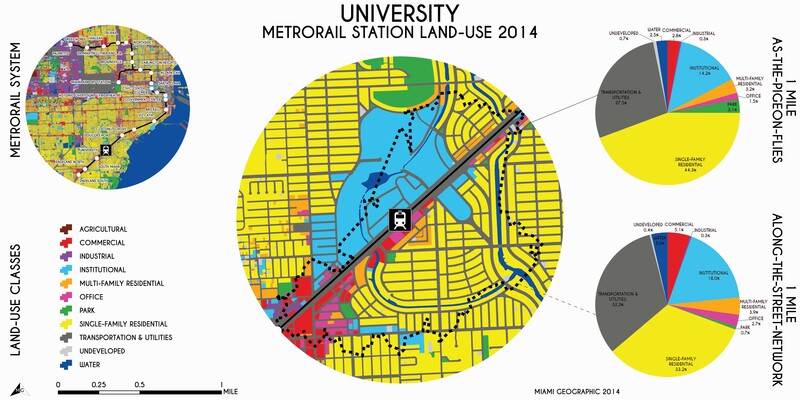 University Metrorail Station Land-Use, 2014. Data Source: MDC Land-Use Management Application (LUMA). Map Source: Matthew Toro. 2014. Douglas Road probably has one of the best distributions of land-uses of any Metrorail station south of the downtown core. This part of the urban region, where the City of Miami meets the City of Coral Gables, is one of its most transformative pockets. It’s dynamism comes not only from its land-use mix, but also the rapidly transforming real estate and streetscape realities. Construction crews are actively building new condominium/apartment buildings in the area. Currently undeveloped land sits at 3.3%, but that number will be reduced significantly within this year. The immediate proximity to the ultra-luxurious, elite-endorsing Village of Merrick Park outdoor shopping mall has made the neighborhood an increasingly attractive site of investment. This commercial plaza hosts, among other high-end shops, The Collection, where the super-rich can purchase Ferraris and Aston Martins. Commercial accounts for 5.2% of the land-use composition. Coral Gables Senior High School is also within the vicinity, accounting for part of the the 6.9% of institutional use. 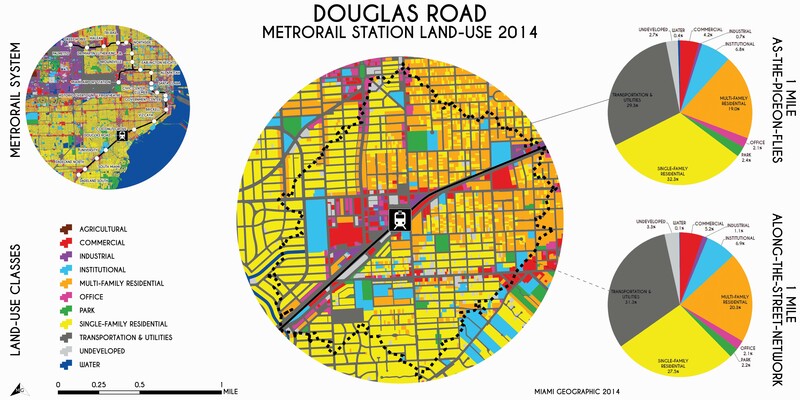 Douglas Road Metrorail Station Land-Use, 2014. Data Source: MDC Land-Use Management Application (LUMA). Map Source: Matthew Toro. 2014. Coconut Grove station is over 55% residential (single-family: 29.5%; multi-family: 27.4%). The near even split of single- versus multi-family homes is remarkable to witness along SW 27th Avenue. On the ground, one can find residential structures on both sides of the avenue. However, on the west side of SW 27th, there are large numbers of one- and two-story duplexes. The City of Miami’s City Hall on Dinner Key is just within the as-the-pigeon-flies 1-mile area, making the share of institutional use at that geographic unit over 1% higher than for the network-based unit. 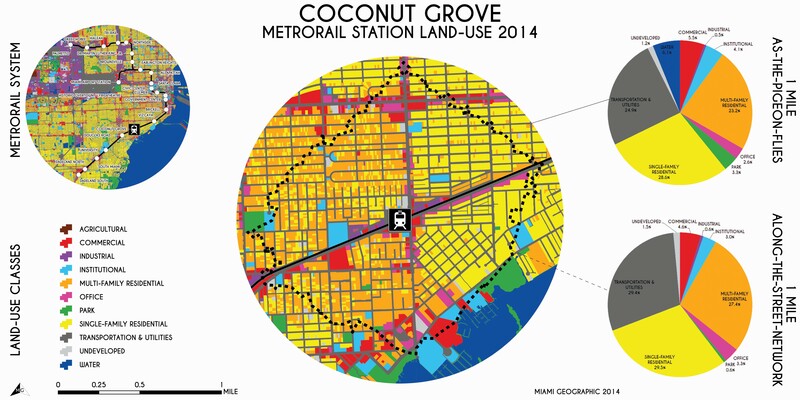 Coconut Grove Metrorail Station Land-Use, 2014. Data Source: MDC Land-Use Management Application (LUMA). Map Source: Matthew Toro. 2014. Vizcaya station is adjacent to the single-family neighborhood known as The Roads, the historic mansions along the bay and in south Brickell, some high-rise condos, the soon-to-be-relocated Miami Museum of Science, gorgeous City of Miami Alice Wainwright park and, of course, lovely and historic Vizcaya Museum and Gardens. 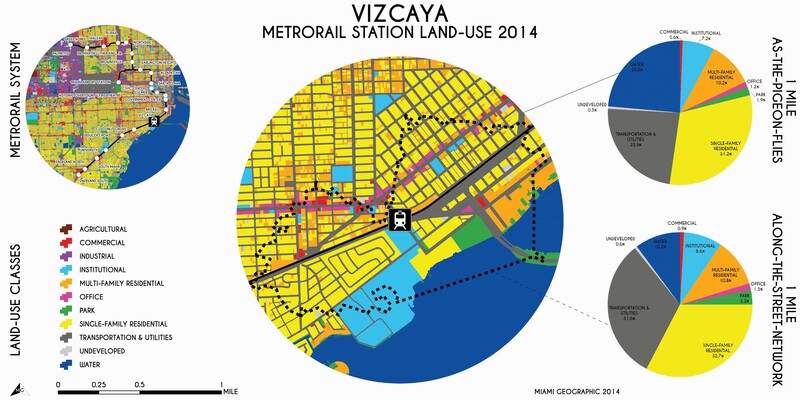 Vizcaya Metrorail Station Land-Use, 2014. Data Source: MDC Land-Use Management Application (LUMA). Map Source: Matthew Toro. 2014. Brickell is one of three Metrorail stations serving the downtown core of the Miami megalopolis (the others being Government Center and Overtown). Don’t be too alarmed by that 6.0% of undeveloped land; much of that is actively being eaten-away by the rising, city-redefining juggernaut that is to be Brickell City Center. Multi-family, office, and commercial space will increase as the phased project continues to materialize before our eyes (and to our collective wonderment). With Brickell serving as the financial business district of our urban core, it’s no surprise to find significant commercial (9.6%) and office (7.8%) space. It’s an increasingly residential area too, with nearly 20% dedicated to condos and apartments, comprising the largest land-use class in the area: multi-family residential. 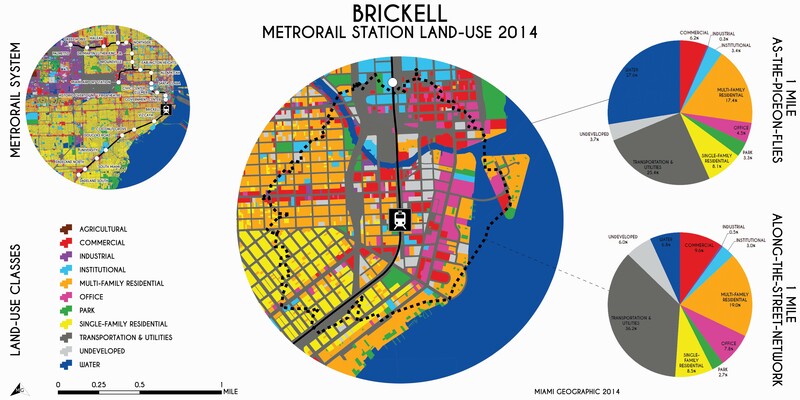 Brickell Metrorail Station Land-Use, 2014. Data Source: MDC Land-Use Management Application (LUMA). Map Source: Matthew Toro. 2014. Government Center is the station most people know, even those who have rarely ridden the train, if ever. As its name suggests, it’s where one can find, well, government. The Miami-Dade County courthouse is there; the US Federal District Courthouse is there; lots of a little court houses and related legal agencies are in the vicinity; all of these government or quasi-government buildings account for the 8.8% of institutional use. Requiring comment is the nearly 10% of undeveloped land in the area, in this, the very heart of the Miami region, the core of the core. That amount of undeveloped land in the center of one of the United States’ most important cities, and perhaps the most important city for intra-hemispheric relations, is astounding. However, just as with the current and on-going transformation of undeveloped land surrounding the Brickell station just to the south, most of that surrounding Government Center station is already, or will soon be, undergoing major development. 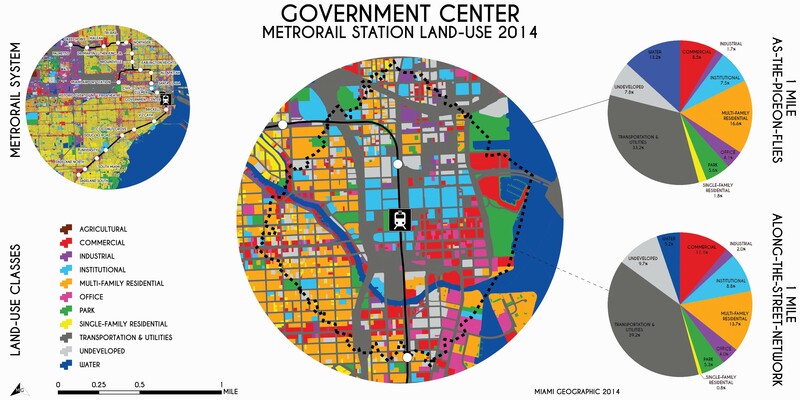 Government Center Metrorail Station Land-Use, 2014. Data Source: MDC Land-Use Management Application (LUMA). Map Source: Matthew Toro. 2014. Overtown is the third Metrorail station offering passage to and from Miami’s core downtown, where the distribution of land-uses is about as equal as you’ll find anywhere else along the system. Here institutional use (11.3%) occupies slightly more space than multi-family residential (9.5%) and commercial (8.0%). Refreshingly, parks become a bit more significant (6.9%), but one wonders if that’s a sufficient amount of public recreation and leisure space for the heart of downtown. For the first time since moving our way through the Metrorail corridor, we start to see Miami’s industrial space (3.0%) emerge. Overtown Metrorail Station Land-Use, 2014. Data Source: MDC Land-Use Management Application (LUMA). Map Source: Matthew Toro. 2014. Culmer is an under-utilized gem of a station. Its land-use configuration is also dominated by institutional use (20.9%), most of it being the various medical-educational facilities comprising the de facto and increasingly formalized Miami Health District. 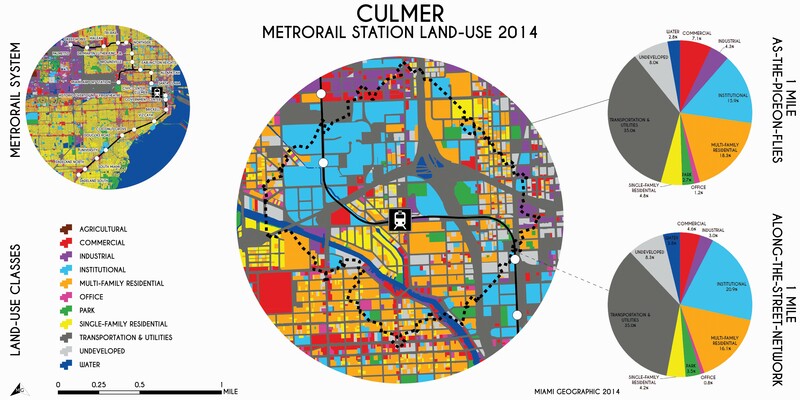 Culmer Metrorail Station Land-Use, 2014. Data Source: MDC Land-Use Management Application (LUMA). Map Source: Matthew Toro. 2014. Civic Center station defines the center of, and is most readily associated with, the Health District. The Health District hosts such staples of the community health and local medical industries as Miami-Dade County-operated Jackson Memorial Hospital, the University of Miami Miller School of Medicine, as well as the UM-owned “UHealth” brand of medical care, not to mention the UM Life Science & Technology complex to further advance UM’s aggressive pursuit of a medical and biotechnology empire. The Veteran’s Affairs (VA) hospital as well as the Miami-Dade College Medical campus are also both located in the Health District, among many other health-related institutes and organizations. Important to note about the Health District is that it also serves as a secondary government and legal district, second only to that found nearest to Government Center station. Still, significant multi-family units dominate the spaces surrounding these institutional uses. The industrial side of Miami — in the form of solid waste processing, factories, and especially fruit import warehouses — begins to become more apparent as one moves toward the Santa Clara station to the north. Civic Center Metrorail Station Land-Use, 2014. Data Source: MDC Land-Use Management Application (LUMA). Map Source: Matthew Toro. 2014. Santa Clara station can be used to access the industrial sector of Allapattah. This station also seems to be the preference for many Miami-Dade Medical Students whose campus is found just off of NW 20th Street. Santa Clara Metrorail Station Land-Use, 2014. Data Source: MDC Land-Use Management Application (LUMA). Map Source: Matthew Toro. 2014. 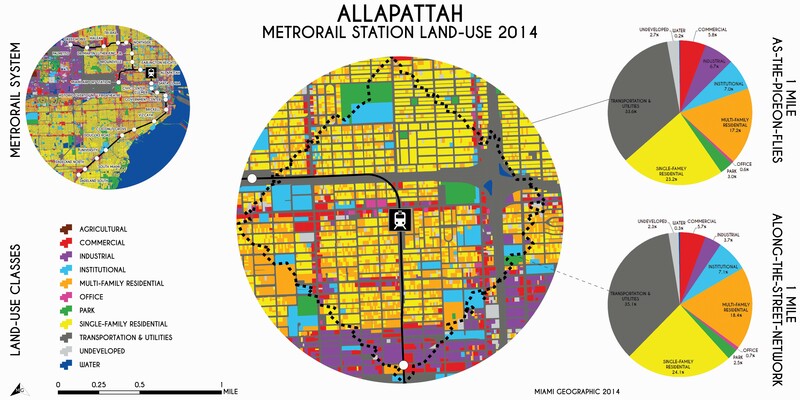 Allapattah station is a Metrorail system node serving the residential heart of the Allapattah neighborhood, whose single- versus multi-family residential split (24.1% versus 18.4%) isn’t too drastic. Standard Miami, along-the-arterial commercial use applies; in this case accounting for 5.7%. Allapattah Metrorail Station Land-Use, 2014. Data Source: MDC Land-Use Management Application (LUMA). Map Source: Matthew Toro. 2014. 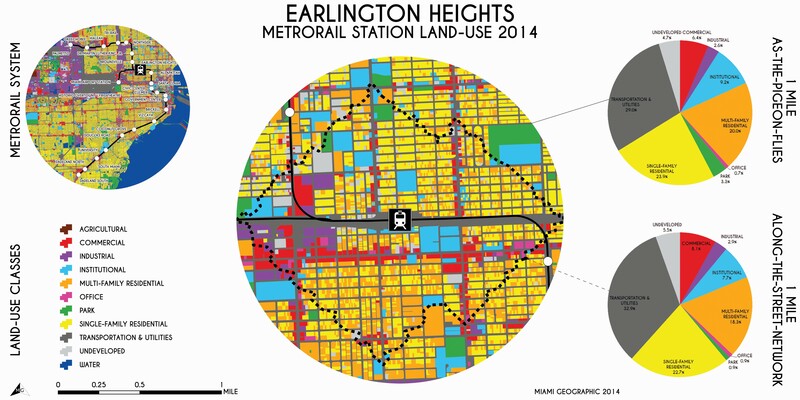 Earlington Heights station is surrounded by a land-use arrangement very similar to that of Allapattah. Notable, though, is the relatively high percentage of undeveloped space: 5.5%. Earlington Heights Metrorail Station Land-Use, 2014. Data Source: MDC Land-Use Management Application (LUMA). Map Source: Matthew Toro. 2014. Brownsville station has an even greater excess of undeveloped land: 7.7%. Continuing with the line of medical analogies: one questions whether an urban system is as healthy as can be when significant pockets of it’s space are left unproductive, effectively contributing nothing to the well-being of the system. Undeveloped land so near the heart of the city, and so well connected (via the Metrorail artery) to other urban organs, virtually begs for investment (either public, in the form of say, parks, or private, in the form of business and economic stimulation). 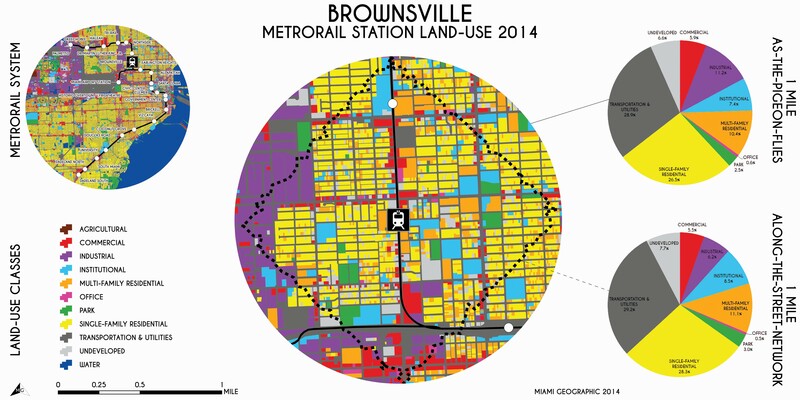 Brownsville Metrorail Station Land-Use, 2014. Data Source: MDC Land-Use Management Application (LUMA). Map Source: Matthew Toro. 2014. Dr. Martin Luther King Jr. station is where we begin to see more clearly that the notion of a purely service sector economy for supposedly post-industrial Miami is a myth. Industrial land-use occupies an even 12% at the 1-mile network unit. The amount of undeveloped space here is also striking at 7.8%. Martin Luther King, Jr. Metrorail Station Land-Use, 2014. Data Source: MDC Land-Use Management Application (LUMA). Map Source: Matthew Toro. 2014. Northside station is just over 20% industrial. Another fifth is allocated for commercial use (9.0%) and to, well, essentially nothing (in the form of undeveloped land: 10.%). Yet another fifth is allocated for the people living in the single-family homes (21.8%) in the area. Northside Metrorail Station Land-Use, 2014. Data Source: MDC Land-Use Management Application (LUMA). Map Source: Matthew Toro. 2014. 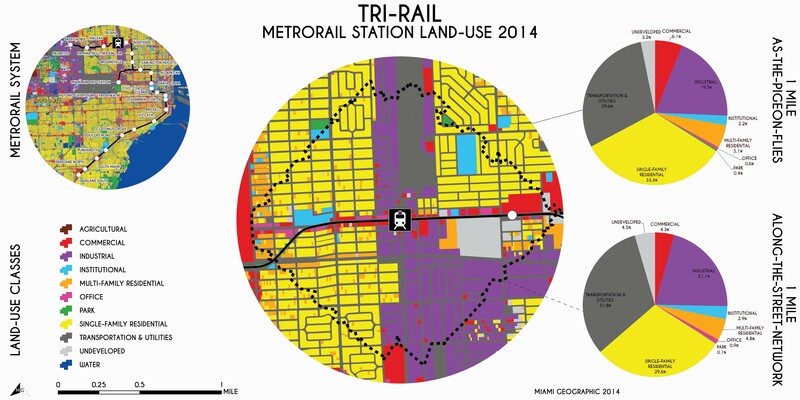 Tri-Rail station is surrounded by industrial (21.1%) and single-family residential (29.6%). Tri-Rail Metrorail Station Land-Use, 2014. Data Source: MDC Land-Use Management Application (LUMA). Map Source: Matthew Toro. 2014. Hialeah station is located just south of the Hialeah Park Race Track & Casino, which accounts for the bulk of the 15.6% commercial use in the area. Otherwise, it’s mostly single- and multi-family residential (24.5% and 18.4% respectively). Industrial use (5.1%) remains significant up in these northwest reaches of the Metrorail line. 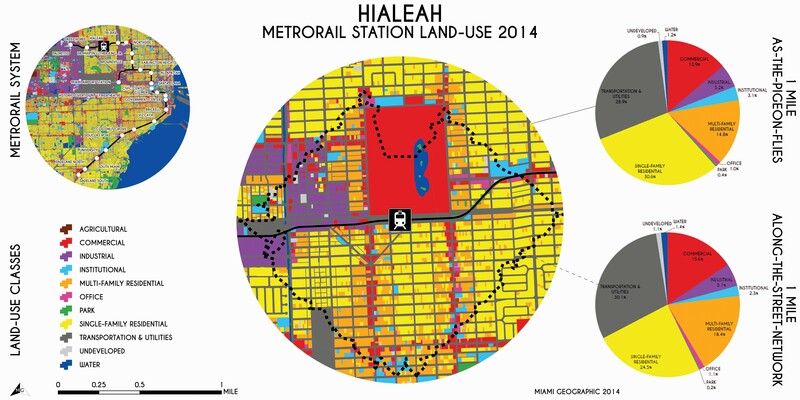 Hialeah Metrorail Station Land-Use, 2014. Data Source: MDC Land-Use Management Application (LUMA). Map Source: Matthew Toro. 2014. Okeechobee station is surrounded by still more industrial use (18.1%) and the standard Hialeah mix of single- and multi-family residences. 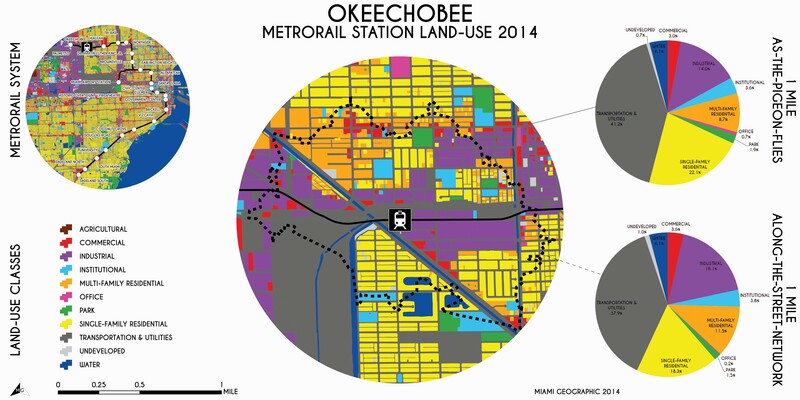 Okeechobee Metrorail Station Land-Use, 2014. Data Source: MDC Land-Use Management Application (LUMA). Map Source: Matthew Toro. 2014. Palmetto station brings us to the end of the Metrorail line, at least the end of the Green Line. Industrial use is overwhelmingly highest here at a whopping 49.6%. 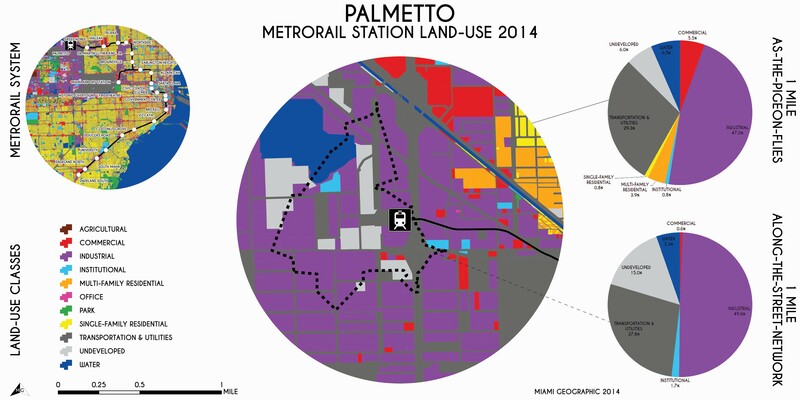 Palmetto Metrorail Station Land-Use, 2014. Data Source: MDC Land-Use Management Application (LUMA). Map Source: Matthew Toro. 2014. Miami International Airport station, the newest station in the Metrorail system, is dominated by transportation-based uses of land (i.e., the Miami International Airport and associated facilities). There is indeed a significant percentage of greenspace, which is classified as park (15.5%), but its important to note that this open greenspace is actually a large golf course and country club. 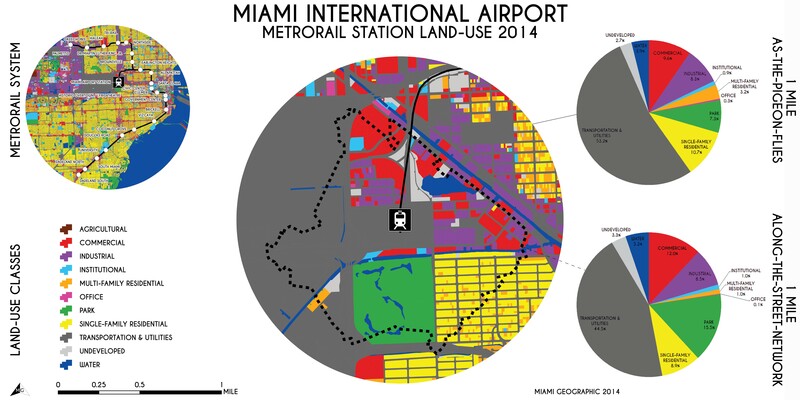 Miami International Airport Metrorail Station Land-Use, 2014. Data Source: MDC Land-Use Management Application (LUMA). Map Source: Matthew Toro. 2014. So what can be taken away from these maps and pie charts? Well, for one, there is a strikingly high percentage of single-family residential space surrounding many Metrorail stations, especially those south of the urban core. There’s also a less-than-expected share of commercial use immediately surrounding the region’s primary rapid transit train system. Park space isn’t as abundant, or accessible via Metrorail, as one would expect in a city as predisposed to outdoor recreational activities as Miami. As the Metrorail system deviates from its primary north-south orientation through Miami and begins it’s more east-west movement in the northern sections of the line, we see very high percentages of industrial land-use, not the type of use that is most amenable to facilitating the movement people through an urban system to connect them to their destinations. While industrial spaces can and do serve as important sites of employment, they don’t generate the necessary flow of people needed to optimize major investments in public transportation infrastructure. The Transportation & Utilities category of land-use is consistently the most, or among the most, dominant land-use classe surrounding each of the 23 Metrorail stations. This is reflective, of course, of the fact that the Metrorail train system is itself categorized as a transportation-based use of land. However, it also reflects an undeniable land-use reality for the entire region, not just those areas surrounding Metrorail: streets (i.e., impermeable paved roadways, designed, in Miami’s case, primarily for automobiles) consume a disproportionate amount of all space in Miami’s land-use mosaic. The stubbornness of residential use speaks to the primarily single-family suburban design of most MC homes, built for the car, and to the fact that the Metrorail still doesn’t go where people need to go. So commercial development is challenging because of so much residential ownership. Dadeland and South Miami malls were already there, so new development has just built on top of what was already there. Development (and profits) along train corridors can only be stimulated if the train developers can capture the value of the land alongside, like FECI is doing, and like most development use to happen in the olden days before cars. MDC doesn’t own the adjacent land, so it has to depend on private developers buying the land and using it. And of course, residents won’t sell that easily. You’re right about the streets…too wide!! and about not enough parks. We have only 1% trees and parklands down here while most cities have around 5%. Some trivia about the Metrorail. The south leg runs on top of the old FEC railroad line parallel to US1. That railroad was on the ground but was put on the highest trend on the ridge so Metrorail is elevated and very high (mostly) meaning it might become a fishing bridge someday in the far future. When it was built they sold it as the first leg of a system that would solve (ha ha) the traffic problems. Of course the stations became magnets for development which brought more traffic so didn’t solve the problem. Then the people who picked the routes made it go three places: Dadeland, the Govt. Center downtown, and Hialeah horse track. None of those needed traffic problems solved at the time as (like now) the I-95 was in bad need of a route. Everyone wanted it to go to Homestead, Miami Beach, and north to Broward but no luck on any of those and even with extensions there is still no route north to the county line. But it does go to an extinct race track. On another note Jean-Michael and I saw the very same Google Street View car on the turnpike yesterday with the same girl driving. JM was very excited to see it. Awesome analysis! In terms of usability, though, the presence of residential areas in the vicinity of a station does not have much bearing upon train use, simply because of the very limited reach of the metrorail and buses being weak and impractical links.